Seeing is believing, right? I’ve often looked at historic animal paintings and wondered “how come artists back in the day couldn’t draw animals?”. We’ve all seen images of animals that are extremely inaccurate, and our recent “Strange Creatures” event had works from UCL Art Museum pop-up in the Grant which included a poorly represented lion, simply because the artist had never seen one. This lack of first-hand inspiration is one reason that the paintings are unrealistic; artists were relying on written accounts by those who had seen the critters. 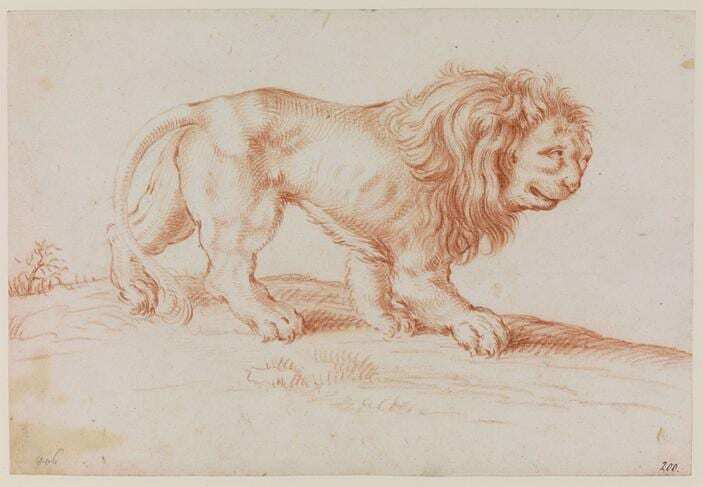 A late 17th Century Dutch representation of a lion from UCL Art Museum. The opportunity to study lions from life in 17th-century Northern Europe was rare. Lions were kept at the Doge’s Palace in Venice and appear in Jacopo Bellini’s (1400–70/1) sketchbooks, but most Northern artists had to depend upon the accounts of other eye-witnesses. But reading these descriptions, another massive source of error is that those eye-witnesses are slaves to prior knowledge. When coming across new forms, unlike anything they’d seen before, many attempted to fit models of animals they already knew on top of what they saw. This is perfectly understandable, but in the end often unhelpful. It’s an interesting example of the brain over-riding the visual system and seeing what it thinks it should see. Some…reported that they had seen an animal as large as a greyhound, of a slender make, a mouse colour, and extremely swift. It strikes me that although they had obviously seen it move, there is no mention of its most noticable trait – that it jumps rather than runs. Does it? When roos run, they do not do so like a hare or a deer, if you ask me. In no way is this true. They do have two obvious toes, but their prints are the size and shape of your thumb and first finger together. …some of our men saw four animals of the same kind, two of which Mr. Banks’ greyhound fairly chased [giving immediate comparison between the two]…These animals were observed not to run upon four legs, but to bound or hop forward on two. 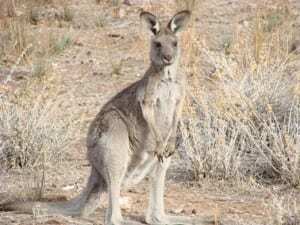 Is it possible that it took two weeks to notice that kangaroos jump on two feet? It’s obviously difficult to disengage my modern experiences of kangaroos (afterall, that’s the point of this post), but I find it hard to accept that the first thing anyone wrote about a kangaroo wasn’t that it was a large animal jumping on just two feet. Instead, it was compared to an animal it resembles in very few ways – a greyhound. …This animal is called by the natives Kangaroo. [much has been written about the veracity of this] The next day our kangaroo was dressed for dinner, and proved most excellent meat. On the 27th Mr. Gore shot a [larger, older] kangaroo…We dressed it for dinner the next day; but, to our great disappointment, we found it had a much worse flavour than that we had eated before. One has to wonder how much the expedition’s scientist, Joseph Banks, one of the greatest naturalists ever, examined these two animals, which varied massively to anything known to science, before Cook had them cooked. He did eventually send some specimens back to John Hunter at the Royal College of Surgeons, but if it were me, I’d be keen to get a full scientific account of a specimen as soon as I could, and cooking it up for eating would only come later. This brief excerpt compares eastern grey kangaroos to a greyhound (three times, in shape, size and tail), a wild dog, a hare and a deer (in movement), a goat (in footprint), a mouse (in colour), a jerboa (in movement and shape) and a sheep (in size). I’m surprised its taste didn’t suffer a comparison (slightly like lambs’ liver, if you ask me). We all have the benefit of knowing what kangaroos look like now, but I wonder if the human instinct to describe things in terms of known objects is a useful trait. Thanks to our brains’ insistence of fitting inaccurate models over visual stimuli, seeing is deceiving, as Jessie J says. Couldn’t we be a bit more imaginative? Have you read any Wilbur Smith, such as the Ballantyne or Courtney novels? That would give a real insight into how lions and other African animals were portrayed back to “civilized” culture three or four hundred years ago.